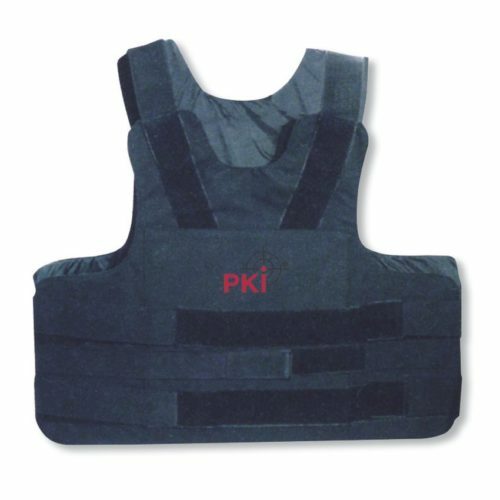 This protection vest against knife-slash attacks is a multi-layer production. The exterior layer consists in solid and rough nylon fabrics and the interior is a fine structured nylon material with good sliding qualities, which reduces friction on clothes that the person wears under this vest. Flexible 1.8 mm thick plastic plates serve as basic protection. The vest as well as the plates offers protection of the lateral parts of the body as well. The most vulnerable area of the body (middle of the thorax and the back) is protected by a 1 mm thick aluminium plate of 23 x 23 cm. All four protection plate pockets are equipped with a tuck-in and Velcro strip to avoid unintended loss of the plates. Due to the light weight of only 1.5 kg and the flexible fixation of the protection plates the PKI 9245 is very comfortable and as such is the ideal protection equipment for long-time operations.